Although most Americans know that exercise is critical to good health and that IT ensures weight control, prevents disease, and strengthens our hearts, almost 60% of adult Americans get little or no exercise! We all know we “should” but that isn’t usually enough to get us moving. The reason you want to start exercising has to feel compelling to you and needs to always be bigger than just wanting to look good. 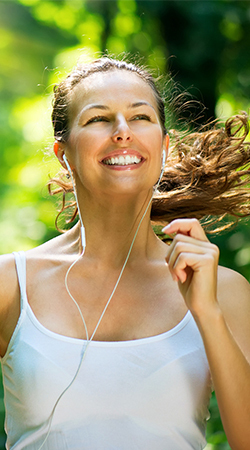 Finding your personal exercise motivation is an important part of any health plan. If you do it because you should, you need to or hate how you look you will likely fail. It’s available everywhere. You don’t have to “feel the burn” to reap the rewards. A daily 45-minute walk, breathing deeply for just 3 miles a day (1.5 miles out, 1.5 miles back) makes a huge difference in weight and fat loss. Deep exhalations release metabolic waste along with CO2; deep inhalations flood your body with fresh oxygen. Choose activities that work for you and are convenient and easy. Always make rest a part of it. Start small and work your way into a regular schedule. Start walking with a neighbor a couple of times a week, then add a yoga class, visit your local gym and start lifting weights. Work out harder one day, go easy the next; or exercise for several days and take two days off. It’s better for body balance and will increase your energy levels when you exercise the next time. After a regular program is started, exercising four to five days a week will increase your fitness level; exercising three days a week maintains fitness level. But any amount of exercise is better than nothing at all! Exercise is integral to good nutrition. It becomes a nutrient in itself. Nutrition is the most important factor for exercise or sports performance. Most of us notice that when we’re exercising we’re not hungry. We get thirsty as our bodies call for water and electrolyte replacement . . . but not hungry. Muscles become toned, heart and lungs become stronger, and fats are lost, but the body doesn’t call for calorie replacement right away. Its own glycogens lift blood sugar levels for a feeling of well-being. This phenomenon is one of the reasons that rapid results are achieved in a body streamlining program. Exercise also promotes an “after burn” effect, boosting metabolic rate for up to 48 hours after a workout! Of all the reasons given what reason is big enough to get you moving? Not sure? Why exercise in the morning? Don’t just solve one part of the problem. Be the solution. At People Biz, Inc., we offer Total Solutions, a comprehensive program that provides clients with the resources they need to lead based on the Transformational Leadership Principle. This program also provides the tools, resources and expertise to achieve total transformation in every aspect of their lives. Leading Change - Recognized by HR.com as one of the Nation’s Top Leadership Programs! © 2015 People Biz, Inc. All rights reserved.